Before they land in the compost pile, Ron Bigelow's using hundreds of discarded fruits and veggies to make a statement. Bigelow is the star of a video from King5 News depicting his efforts to raise awareness of the issues with food waste. At his farm, Bigelow breeds rare ducks, grows small patches of vegetables, and raises chickens and hogs. To feed the latter, Bigelow heads to local farm stands to grab their leftovers: thousands of pounds of perfectly good produce that would normally go to waste. Even with the best efforts of his animals, though, he can’t use up all of the produce he gets. 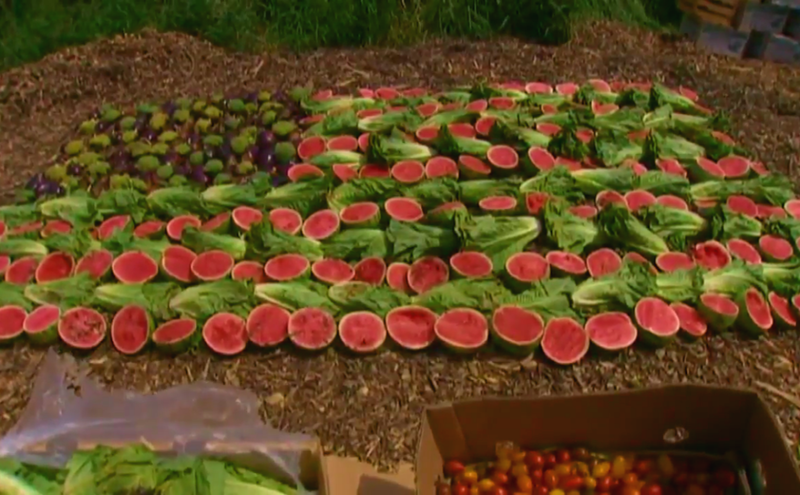 It goes into compost piles, but before that, Bigelow crafts three-dimensional food waste paintings to post on his Facebook page: American flags made of eggplant, lettuce, and watermelons; flowers made of carefully arranged greens, tomatoes, and yellow peppers. “I look at this stuff that I’m putting into compost and say, ‘wow, how many people can we feed with just this and that? A day’s food for a hundred people? More? '” he tells King5. Bigelow is working on a small scale, but he’s one element of a larger movement: to figure out how to actually feed people with the food we grow.